Miles, on the other hand, doesn’t seem to have much of a future. His life has been dominated, overwhelmed, by his search for his missing twin brother, Hayden. Miles receives a letter or a phone call every now and then and he tries to compile evidence for or against Hayden, but it’s increasingly clear that his twin has a very tenuous grip on reality. Hayden lives in the world they invented as children. He’s a paranoid schizophrenic, believing he’s being hunted by the government, committed to living the ruin lifestyle, outside the law and off the grid. Miles tries to start a life of his own, a normal life with a job and friends. But he is constantly drawn back to his search for Hayden, his desire to understand his twin’s delusions and perhaps his own feelings that without Hayden he’s hardly a real person. Now he’s driving towards the Arctic Ocean, half-hopeful that he’ll finally find Hayden, half-resigned to another dead end. Await Your Reply suggests that identity is fluid, that we make ourselves anew all the time. The characters in this novel happen to do it in spectacular fashion–they leave behind everything they know, abandoning their homes or families or even their names–but at its core the book suggests that we’re all involved in a search for a “truer” identity. We’re never finished remaking ourselves. We all hold onto dreams and some of us would do anything to make those dreams a reality. Would I recommend? Yes! 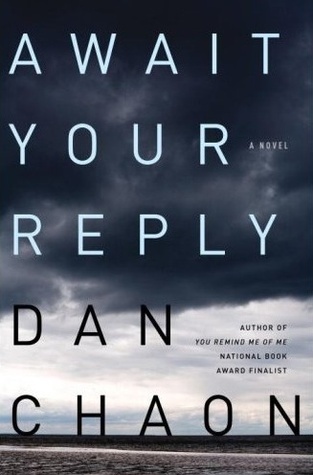 Await Your Reply is gripping and extremely entertaining and the payoff will not disappoint. It’s one of the best books I’ve read this year and I’m adding it to my list of favorites!